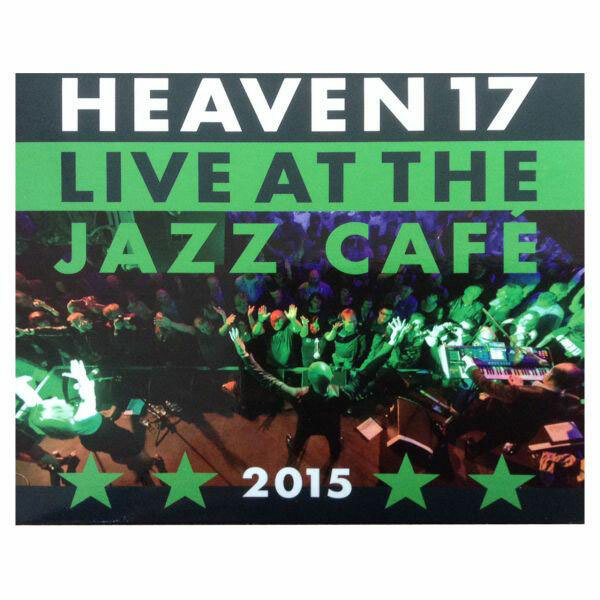 Last Friday, just weeks after finally posting my rave review of the 2014 H17 live album/DVD combo pack, came news from H17 HQ that their recent gig last Spring at The Jazz Cafe had been recorded and released as a live double CD. It’s pretty common for bands to be pushing the live CDs of every gig around these dark times, but the last live album was an eye and ear opener about how powerful this band could get. When I heard it, a mental line in the sand had been crossed and I found myself thinking “this is the hottest band going right now!” Heaven 17 have honed a live band that was truly hot and believe me, no one would have expected it on the face of it. After listening and loving the 2014 album, my thought was “I need to see this band live – they are reaching towards the live standard of Simple Minds in ’83-’84, which is to say that they are now one of my favorite live bands ever. When it comes to live Simple Minds, I am a sponge for whatever live recordings I can get. Some of them [which are not ‘official’] are my favorite recordings of the band ever. Irvington, NJ from the 1984 US tour is a particular jaw dropper. H17 are not far behind that standard with their supremely capable live team who can really make their music sizzle with an energy that their studio records, as great as they are, pale in comparison. So the news that a live CD/DVD has been followed a year later with… a 2xCD of a full concert is actually pretty compelling to me! To the point where I soak up all that I can get. This set has the by now mandatory Malcolm Garrett cover design, in addition to a fan photo-packed booklet. The big difference with this package was that the set here was four songs longer. On the face of it, not a radical leap, but the titles above in boldface were not on the last album. That’s twelve new numbers in the capable hands of this dream version of H17! Look at what awaits us! The hot new single [“Pray” b/w “Illumination”] from the upcoming album is there. As great as the vinyl was, I imagined that these songs would be realms better with this band at the helm, live. And that’s just the start of it. Two of my dream Human League tracks [“Crow + A Baby,” “You’ve Lost That Loving Feeling”] are here and so is “Circus Of Death.” I love how vintage Human League material is now a part of many H17 sets. This is a right and proper thing. I’m also excited to see the sumptuous ballad “Best Kept Secret” added to the set. When I played “Luxury Gap” compulsively last year, this was the song that was really sticking to my ribs in a new way. It’s also thrilling to see two great covers in the set for that twist of B.E.F. juice that makes everything gel nicely. The band’s version of “Party Fears Two” is a classic Associates cover juxtaposed with Glenn’s [and keyboardist Berenice Scott’s] time in Bowie SuperCoverBand Holy Holy. From their set lists comes the Billy MacKenzie-inspired cover of Bowie’s “Boys Keep Swinging.” Does it get any more symmetrical than that? Don’t look for this in your local CD ghettos. It’s for sale at the H17 merch table or in the H17 webstore for a modest £12.00 [$18.44, today] plus shipping. Autographed for just £3 [$4.61] more, if you’re of that persuasion. Me? I’ll settle for the basic CD once I get back from my vacation and see how many shekels I have to rattle together. This entry was posted in Core Collection, Want List and tagged 2015, Heaven 17, live album, Live At The Jazz Cafe. Bookmark the permalink. looks like the signed option has gone already ! nick – Wow! I didn’t think to actually click it! That certainly didn’t take very long! Makes me think “order sooner than later!” Gulp. Welcome to the “New Scarcity!” How I hate it. wish i’d bought the BEF box set when they were selling that but i was way too late for it. I only have the 35 times [not really] already so who needs another version ?? And they were charging a fiver for those signatures too !! nick – You and me both! I imagined that it might still be for sale six months later! What’s worse, I think my B.E.F. CD of “Music For Listening To” might have been in my wife’s car when it was stolen two years ago! I went to play it recently and it’s not there. There were about 5-6 CDs we lost and she did not know what was there apart from “Catholic” by Gavin Friday and “Homeland” by Laurie Anderson. We re-purchased those but we were not sure of the others. I suspect the missing B.E.F. and also Patti Smith’s “Gung Ho,” which is also missing from the racks. On the other hand, in at least -one- instance [Colourbox] I did buy the complete 4xCD box that 4AD released in 2012 in pre-release for $30 [!!!] from the 4AD webstore only to see that title hit a solid three figures in less than a year. Too bad I didn’t buy the copy I saw in a local store too but there was no money for speculation any way. what a bummer ? I never used ‘shop bought’ cds in my car, i burn cdr’s if i want to listen to them even for short trips. The only place i have seen this is on Ebay briefly but they wanted £40 for the set. I could download it but have only seen on Amazon and their quality can’t be relied on. And i so need the instrumental of ‘You Keep Me Hanging On’……. have the tape kept warm somewhere in the batcave so should be ok. I don’t do ITunes but there again i don’t do Apple….don’t get me started on that one. I’m hoping one day to find it cheap enough to purchase – after all we ALL want the product don’t we ?? arrgghh you swine !!! thats just a wind-up on the Colourbox front. I originally had that pre-ordered from Amazon [ it was going for about £12 i remember] and the week before i cancelled it as this would have put me overdrawn at the bank. I never got to re-order it late and look now, can’t get it for love nor money……i try not to let these sort of things go now….at any cost. I definately WON’T be buying the Once Upon A Time box though………. nick – Ouch! You’ve got that right! I’m starting to get nervous about the “Sparkle” box. I feel if I don’t get it in a few months it will be too late. But Jim Kerr would have to pay me to accept the “Once Upon A Time” Super Deluxe Box. Oops! Did I mention it in this blog? My apologies! P. S. – Thanks so much for calling me a swine! I’ve waited over 50 years for that !! i thought ‘swine’ was a polite enough curse for the purposes of such a quality blog-ette…. Sorry to spray rain all over this comment thread, but I got one of those signed copies! I am a bit ambivalent about the cover art – think I need to know Malcolm’s process for this one – so if it’s got some signatures on it I won’t mind that at all… As for the song selection – WOW! Not at all surprised, but happy to see Party Fears Two/Boys Keep Swinging…Martyn and Glenn do more to keep the legacy of Billy MacKenzie alive than anyone these days…But it’s the last three songs on cd1 that most interest me…the transitions could be a lot of fun…Happy to see Trouble included and especially Dive which has become one of my all time favorite H17 tracks. Echorich – Yes, it was happy-making to see the two fine singles from “Pleasure One” resurface here. What a fantastic set list! As for the cover, it seems to follow on from the “Pray” 12″ cover with monolithic text dominating. I’m interested to see what the eventual album looks like. This looks like it’s part of the suite. It is weird how H17 have turned out to be such a great live band, never expected it! My jaw ached from smiling pretty much the full length of the gig I witnessed last year, what’s extra great to see is the chemistry between Glenn and Martin, either they’re simply great show biz professionals or they’re still really enjoying this, a bit of the former and a lot of the latter I reckon. Requested the Metropolis release as a birthday gift, on your recommendation, and love that. SimonH – It probably helps that they never toured in their heyday, and aren’t burned out. I’m just thrilled that at some point a switch went off in Martyn’s head and the notion of building an incredible live band to do this music justice became the thing for them. It can’t be cheap, but it is awesome. It shows what is possible when a band is playing for the music and sheer enjoyment of it instead of money. I have the Scala DVD. Night and day, my friend. Nothing you’d want to watch more than once. Hope they make it to the States (within travelling distance for you) before too long, was hoping for pre Xmas UK dates but nothing yet. SimonH – Still hanging on the H17/DEVO team up US tour Martyn mooted a few years back. Maybe when the new album gets out it may happen. I just hope the budget is there to avoid a laptop gig over here. I don’t kid myself there would be any tour support. That said, I’d still be there in a heartbeat. That’s a pairing I would travel for, saw Devo a few years back – even my gig resistant wife came to that one, and loved it.